Surface driving rolls and take-ups (winder or batchers) are common motor drive applications. They are generally straight-forward with the level of the control scheme sophistication being dependent on the degree of accuracy in required tension control. 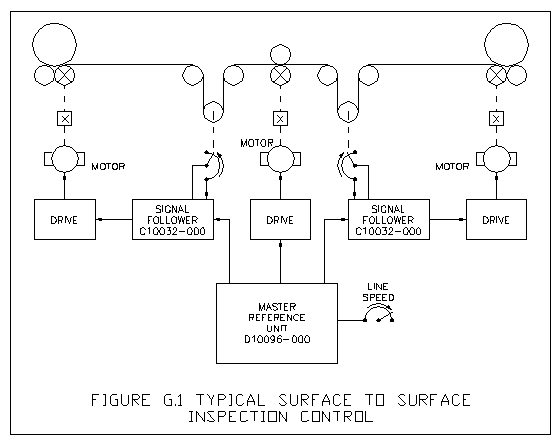 Most of the application examples detailed in Section E, Multiple Drives – Coordinated Control, utilize surface driving rolls. Because the web is transported by surface contact with driving rolls such as S-Wraps, Nip rolls, coated rolls and “bed” rolls take-up arrangements, no diameter compensation is required and the motor load is normally frictional. As illustrated in Figure G.1, the material unwind or winder roll can rest on two or more “bed” rolls, sometimes driven by one motor. On winders, the first “batcher” roll is driven at line speed and the second “packing” roll is geared at slightly higher speed to develop the final winding tension or so called “packing ratio”. A separate drive and motor for each of the bed rolls can allow an adjustable packing ratio – although the batcher drive may require Regeneration capability to prevent the batcher motor from being overhauled by the packing motor. There are many variations on this type of take-up. Reversing is sometimes required in order to allow the web to be processed “face in” or “face out”. The reverse function is sometimes utilized to Reverse Jog the take-up to remove sections of the web as in inspection equipment. Note that the “batcher” and “packing” roll functions must swap positions if significant yardage is wound in the reverse direction. The illustration depicts a typical surface control scheme. A dancer mechanism sets web tension, provides accumulation and controls regulation during acceleration and deceleration. With this dancer scheme, a parallel reference system from a master reference unit is utilized. The Nip rolls set line speed and are not trimmed. In some cases of relatively low line speed, slow acceleration, and when handling a web not sensitive to tension, the dancers may be omitted in favor of manual trim pots. These pots should be limited in total range and should be multi-turn types to prevent the operator from introducing sudden large speed changes.